A six-issue Tomb Raider comic written by Rhianna Pratchett will be made available early to Best Buy pre-order customers. It's a big year for Lara Croft; she's getting a new look and origin story in Tomb Raider, due out in just a few weeks, and making a return to comic books. Dark Horse has announced that it is teaming up with Crystal Dynamics to publish Tomb Raider: The Beginning, a six-issue series that will serve as a prequel to the events of the upcoming game. 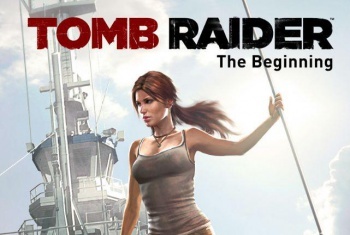 Written by lead game writer Rhianna Pratchett, this will be the first time Lara Croft has appeared in comics since 2005, when Top Cow ended its Tomb Raider series. Pratchett stated that the comic allowed her to "flesh out the world of Tomb Raider and work with the talented team at Dark Horse to bring Lara Croft back to comics." The Beginning reveals the start of Lara's first big archeological adventure and explains how the game's crew came together on a mission to find a lost Japanese kingdom. According to Dark Horse's press release, fans who pre-order Tomb Raider at Best Buy will receive the full 48-page hardcover omnibus early, though Tomb Raider: The Beginning doesn't have a release date yet. The press release refers to this as the "first series," but there's no word on Tomb Raider's future in comics after The Beginning. More information about the comic will be available after the game is released in March.